Considering buying the “Survive the End Days” package or wondering if the 2017 doomsday prophecy theory it uses could be true? 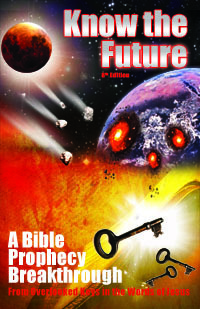 Find out the truth about the author “Nathan Shephard” and the many errors in how it uses Bible prophecy to predict WWIII during President Obama’s last years. What About Jim Rickards’ book “The Death of Money”? Is a “dollar collapse” possible and imminent as Jim Rickards says in the “Death of Money” (along with others)? The Bible actually speaks on this topic in Revelation. Find out why a financial collapse will not happen no matter how many people say so. Is an asteroid impact at Puerto Rico going to cause a 200-foot tsunami which strikes America’s East Coast? “Prophet” Ephrain Rodriguez says so based on prophecy he received 40 years ago. Is his word accurate compared the Bible? Proper understanding of Wormwood (Rev 6-8) and America (Rev 17-18) in Revelation shows where he may have heard from God and where he probably let Christian eschatology and conspiracy theory slip in.